Grey day on the water today. 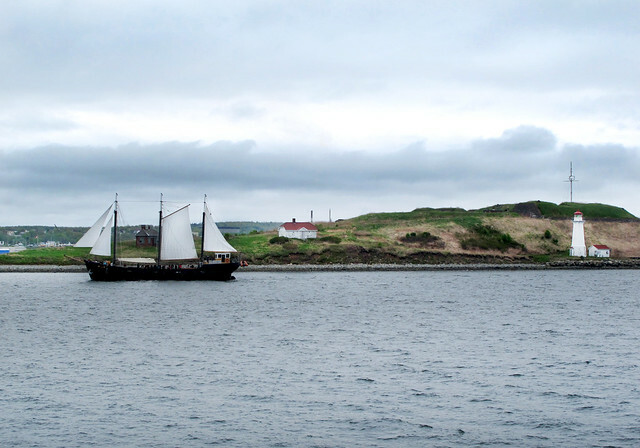 This is the tall ship Silva, a frequent sight out our window, passing Georges Island. Tall Ship Silva was built in Karlstad, Sweden in 1939 as a 130' three masted steel schooner. During the first two decades of her life, she was traded with general cargo under sail and motor in Western Europe. In the 1960's Silva was refitted as a bulk freighter, having her sailing rig removed. Silva continued coastal trading in Sweden until 1994. In the summer of 2001, she was towed to North America and restoration was undertaken. She is now completely re-furbished and rides the water as a charter boat here in our harbour.